Also known as the Stone of Courage and the Stone of Truth, Amazonite is believed to help you verbalize deep thoughts in a balanced way and to see more than one point of view. Ancient peoples prized this turquoise beauty as an amulet stone. King Tut’s tomb contained several Amazonite treasures, including a scarab ring set in silver. Historians believe Amazonite was the third stone in the breastplate of the Jewish High Priest. The name Amazonite comes from the Amazon River, though geologists don’t believe the stone was actually found there. Sources include Russia, the U.S., Madagascar, and Brazil. Legend attributes its name to that of the ancient Amazon warrior women who adorned their shields with it, cured illnesses, and healed wounds. 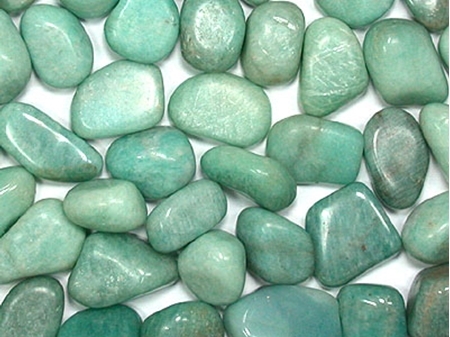 Businesses can use Amazonite to attract new customers and protect against unfair business practices. Gamblers consider it a lucky stone. It stimulates artistic ability and creativity. Parents can hide it in a child’s bedroom to encourage tidiness. It blocks geopathic stress and protects against electromagnetic pollution. It’s believed to make married life happier. Amazonite stimulates the heart and throat chakras. It eases problems of the throat and thyroid and, as an elixir, is said to rectify a calcium deficiency, prevent hair loss, and clear acne. 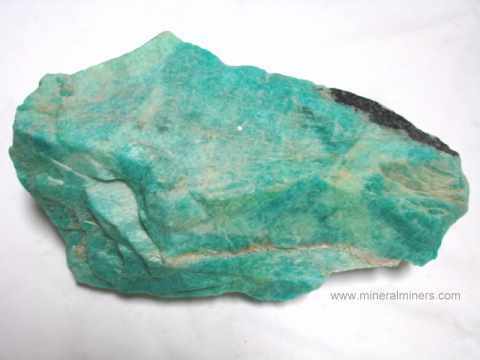 Feng Shui experts say Amazonite’s energy is water, typically associated with the north area of a home or room. Because Amazonite is easy to crack or chip, care must be taken with it. Don’t wear it during physical activity, and clean it with warm, soapy water. Store it apart from other jewelry. This entry was posted in Sunday's Gem and tagged healing amazonite, healing gemstones, properties of amazonite. Bookmark the permalink. Wow Debbie, even though I knew this stone, I had no idea about the presence of lead giving its color! Yes, that’s right…because if its bluish/green color. Which are the colors of the throat and heart Chakras. I love the first photo you shared of the stone in its uncut, raw form. Beautiful! Whenever I see a piece of turquoise, I always think about the perfume that Ralph Lauren created many years ago (2005) called, Pure Turquoise, which had a gorgeous turquoise gemstone on top of the bottle cap. It was such a beautiful scent too. Thanks so much for sharing another interesting gemstone post, my friend. Enjoyed! Ron, I like Amazonite in its raw, uncut form too. I have some Amazonite beads that I used to make a bracelet, forgetting just how delicate these stones are. Well, it wasn’t long before they’d rubbed into one another and made all sorts of nasty scratchy places. I should’ve heeded my own warning! I wasn’t familiar with Pure Turquoise so I researched it online. What a pretty bottle! Now if the Internet ever developed a feature where we could sniff and taste, we’d all be happy, right?! I don’t care what it does or doesn’t do. I think it’s beautiful, and I’d love to have a silver and amazonite necklace. Since it’s associated with tidiness, I wonder if a sprinkling of stones would make it easier to clean up from Hurricane Harvey. At this point, I know a lot of people who’d be willing to give it a try! Linda, I think an Amazonite necklace would be way more practical than a bracelet. I learned this one the hard way. I guess the stones are just too soft, or probably I’m just too active, ha! Its elixir form makes it sound like snake oil. I don’t know whether the thing works or not on tidiness. I suspect somebody somewhere left a piece in a child’s room but the child was naturally neat, so it merely appeared that the stone did the trick. Who knows? Still, it’s a beautiful color. Have you used Amazonite in your jewelry designs, Lana? I made some earrings with it, and they’re fine; the bracelet is a wreck! I don’t fault the stone — I imagine it was my own doing. I’m a bit careless about removing jewelry for things like house cleaning, gardening, sports, or whatever. I’ve not used Amazonite yet, Debbie, but I like it a lot and would love to use it. Alas, I know what you mean, I am careless with my jewelry sometimes also. I guess we need to be more careful. I’m pretty careful with the GOOD pieces. I just get lax when it comes to the semi-precious stuff, probably because it’s not as expensive or rare. Sigh. Might be the stone of bookselling. Nice report, Debbie. If that’s true, I’d better stock up!! Thanks for reading, John.